I like my Veritas low-angle, bevel-up smoothing and jack planes, but I do not like their rear handles (totes). The handle has broad flat sides, and is more vertical and less curvy than a classic Stanley or Lie-Nielsen. While some woodworkers may like the design, I find it to be unfriendly to my hand. Here is my prototype (in poplar wood) of an alternative. 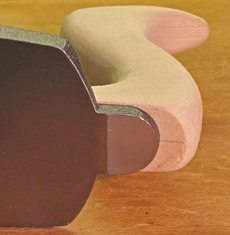 The shape is based on the classic handles. It feels right to me. 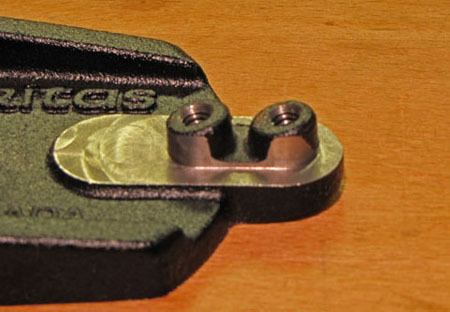 Adapting this shape to the Veritas handle mount takes some engineering. 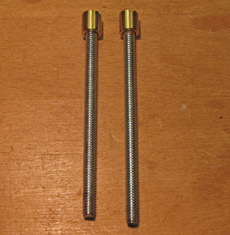 The Veritas handle is secured with two bolts that enter the base at an angle. The company supplies a full-scale measured drawing of its handle that also helps to design your own version. However, the two-bolt system prevents what I consider a nicely shaped handle because the curve intersects one or both of the bolt pathways. My solution involves using a short front bolt to replace the stock bolt. 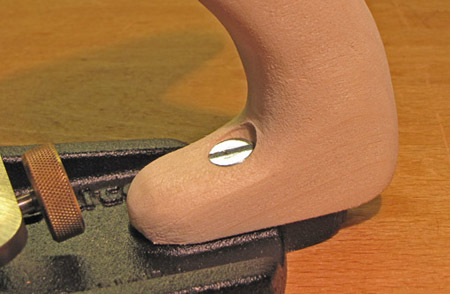 The counterbored stock rear bolt runs through the full length of the handle while the countersunk replacement front bolt goes through just the front projection of wood to enter its hole on the mount. 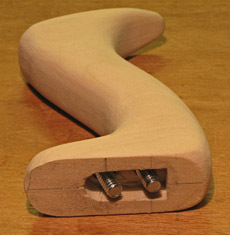 This allows the wood above it to be cut away to create a hand-friendly curve in a classic style. 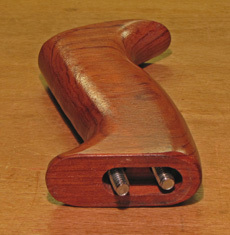 The back of the new handle projects beyond the mount. For a permanent handle, bubinga would be the best choice because of its strength. It is also a beautiful wood and will match the Veritas front knob. I mentioned my dislike of the Veritas bench plane totes in a previous post. 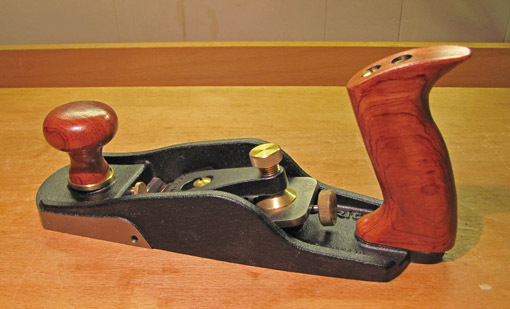 Since then I learned from Chris Schwarz’ blog that Bill Rittner is making superb quality replacement handles for old Stanley planes. I asked Bill if he was making an alternative for the Veritas handles. He is not yet but is interested. I hope he will because, while I enjoyed developing a solution to the Veritas tote “problem,” it was painstaking to make even the prototype in easy-going poplar, inelegantly sanded to 120 grit. I’d rather make furniture. Pending further testing and refinement, I think that many otherwise happy Veritas bench plane users would appreciate this kind of tote professionally made. 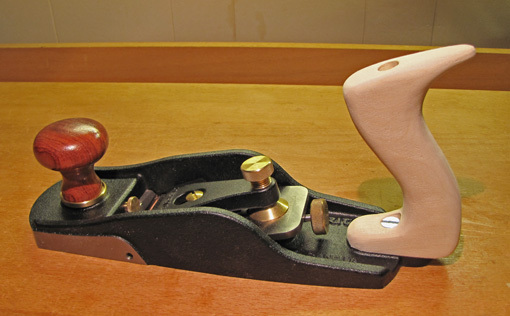 A helpful article, “Totes and Knobs for Handplanes,” by Charles Murray, in the November 2009 Popular Woodworking describes the use of a shop-made jig to make a plane tote. The resulting tote has flat sides with roundovers made on the router table. However, it would take considerable additional hand work, starting with a thicker blank, to produce the nice elliptical cross section seen in Bill’s totes. I will have more detail on the design and construction in a future post, and possibly an update from Bill. I also have to do more shop testing of the prototype. Thanks, Joe. I had not seen that. I looked it over now. It also uses a short front bolt but requires drilling and tapping a new mounting hole for it, though that does not seem too difficult. Looks like an excellent method. This is why I have gone (almost) exlusively with LN planes and chisels. They just seem to fit my fat fingers better than the LV. Like you, I would rather be building things than repairing my tools. I have a couple of old Stanleys and I made them more comfy by using some sandpaper. BTW, I got a marking knife and bird cage awl from Bob based mainly on your recommendation. YOU ARE RIGHT! Haven’t used them extensively yet, but they are beautiful and fit my hands very well. Yea, it’s a close call for me with L-N and LV BU planes. +’s and -‘s for each, but they’re both great tools. Bob makes wonderful tools. Enjoy! Nice improvement! I, too, find the Veritas totes very uncomfortable. I have tried making a tote and rounding edges on a router table, but it’s not easy. Tearout and fingers close to the bit are two issues. I’m curious; how did you countersink the short-bolt hole? There doesn’t seem to be clearance above the hole to get a bit in there. My solution for a similar situation in the past was to drill the hole (from the bottom), then with the bit protruding through the hole, attach a Fuller countersink (at the end of the bit, upside down), reverse the drill, and pull the countersink down. I shaped this prototype by hand because I wanted to test the feel and adjust it as I went along. The PW article referred to in the post has jigs for shaping a handle, but I’d still want to do some hand work after that. I used a flexible shaft to barely get in there with a countersink, but I think your idea would be better! I’ve checked out the hands of Tom Lie-Nielsen, Schwartz and other plane afficiandos. They all have what my mom called “piano player hands”, narrow palms and long fingers. My friends with similar hands all like the older Stanley’s with the very sensuous totes. Now us guys with big mitts seem to like the upright, hand filling Veritats totes alot better. If you keep up with firearms the current wave of handguns come with the option of small, medium or large handgrips. It seems like it might have potential for totes. I know I find the totes on my L-Ns a little small. I have a saw coming from Medallion Toolworks that is custom made to my grip. The prototype fits like a glove. I purchased one of Wenzloff’s first batch of Kenyon dovetails saws from the WIA original. Beautiful saw that has never touched wood in my hand, the handle is just way to small. About a 2 1/2 finger grip at best. Custom totes and S,M,L options might be the wave of the future. Thanks. Good idea! Even having “standard” and “large” options would be helpful. I suggest you present your idea to LN and LV.